A very good Italian friend Vito, inspired me a lot in perfecting this method of cooking chicken. He was a natural braaimaster! It is all about low heat and turn, turn, turn. It must not burn. He consistently braaied perfect chicken. Tender, cooked right through and not burnt. It took a lot of hard work though! My way you dont have to turn turn. Then pull it apart and press it open. 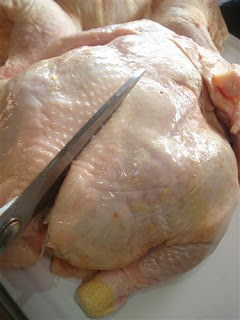 Use a sharp knife to cut down the centre, inside, at the back of the breast. Not right through-just to crack through the bone and cartilage. This is to help it flatten. Not many people know this, but I steal with my eyes and once watched a butcher doing it! You can also insert a skewer as you see in the pic below. This keeps it all nice and flat. Then any mixture of FRESH herbs you like. Fresh basil, garlic, a little rosemary, all chopped fine and mixed with a little mayonnaise, yoghurt, olive oil or all 3 if you feel like it. Go mad. Experiment. It eont be bad I promise. I always put as many fresh chillies as I think I can get past my wife! Toss it all in a large bag and leave it in the fridge for as long as possible. Then....GET THE HEAT RIGHT. Get your braai coals well burnt. Should be plenty of them so the heat lasts. Test it by holding your habd over the heat. You should be able to do about 2 to 3 seconds. Place opened side down on the grill. 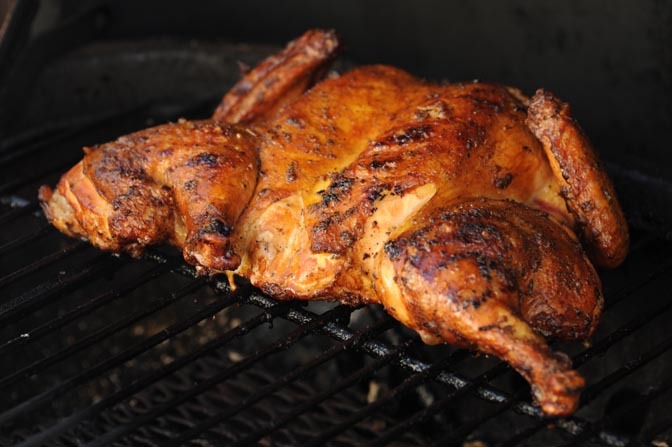 Now for the secret to tender, succulent braaied chicken! Cover the chicken with silver foil! 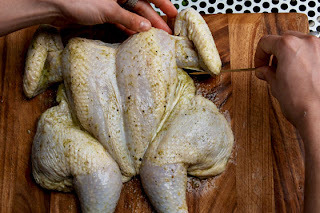 Roll the edges or crumple them to form a stiff edge so you can lift the foil off and on often for checking and basting. If it is too hot, and its causing too much flare ups then simply take it all off the braai, have another glass of wine and wait 20 mins. Do not be impatient. Heat is everything. After cooking 20 minutes turn it over skin side down and cook for another 20 min. A total of 45 min should be good. If it looks like its burning then your fire is too hot. Its all about temperature. Good looking chicken! I think spatchcock is the best way to cook a chicken. thanks guys for all your comments and for visiting. I must confess I get a lot of inspiration from other blogs like you guys!